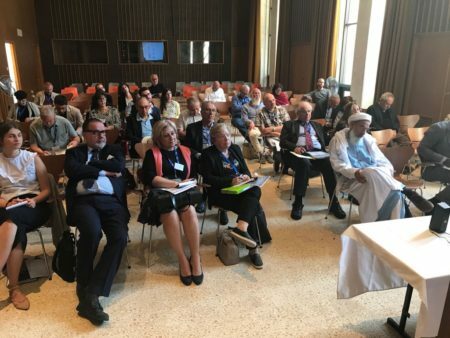 Elijah’s Hermes Forum for the Interreligious Study of the Mystical and Spiritual Life held its fifth gathering in Jerusalem in October. 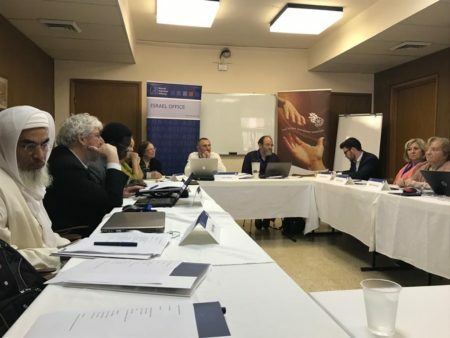 Alon Goshen-Gottstein chaired a meeting of UNESCO chairs in the field of interreligious and intercultural relations, together with members of the Hermes Forum on the theme of “Mysticism, Identity and Sacred Space.” Here is the challenge: Does re-ligious competition arise from competing needs of identity? Does sacred space and contested sa-cred space become a source of identity conflict? Can a mystical approach to religion help ease tensions resulting from identity needs of religious communities? 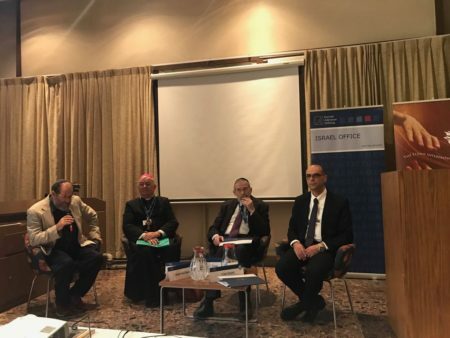 Read on for snippets of a discussion that paves the way to the next meeting of the Elijah Board of World Religious Leaders, next November in Spain, where Religion, Mysticism and Identity will be explored by world religious leaders. The Konrad Adenauer Stiftung sponsored the meeting, together with the University of Bologna. Papers were presented from the perspective of five religious traditions, from the fields of history of religions as well as from practitioners of the mystic practices of their various faiths. 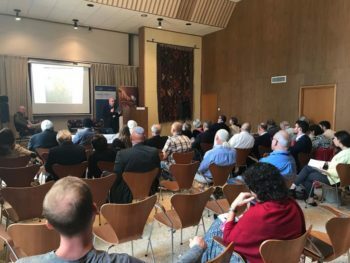 * Steven Shankman, Chair for Transcultural Studies, Interreligious Dialogue, and Peace at the University of Oregon, U.S.A.
Paul Fenton brought an example of how one strand of Mediaeval Judaism was able to absorb Muslim ideas and practices. Rabbi Abraham, son of Rabbi Moses Maimonides, was heavily influenced by Sufi ideas, leading to a reform of practices of prayer. Rabbi Abraham justifies these as retrieving the lost Jewish wisdom, thereby making the wisdom of the other one’s own. Read on for an illustration of how Sufi prayer practices are incorporated in a Jewish context. Clearly, a mystical context allows for a broadening of boundaries and revisiting of relations to the religious other. What is required of every individual when alone in his prayer space (mawda‘ salâtihi) at home. It is required that he have a designated place (maqôm qabu’a), as I have explained, and that this place be in accordance with his [living] conditions and place of residence, whether as part of his home set apart for this purpose, or a corner (zâwiya) of his house reserved [for this] as far as possible. The mat (hasîr) or carpet (bisât) or such objects that he sits upon [for prayer] should be pure and clean, and if it is possible to have them specially set aside for this special purpose, how much the better ! This place or corner should be preserved not only from dirt and filth, but also from dust and the like. And whatever is added to this out of reverence (tawarru‘) is a sign of greater regard for what is due in devotion to [G’d], may He be exalted, and provides for greater preparation (tahayyu’) and sincerity of concentration (ikhlâs kawwânâh) and strengthening of the fear [yir’âh] [of G’d]. Efim A. Rezvan (left) and Muzaffar Iqbal (right) both spoke about Islam or, more accurately, Islamic identity. A significant debate resulted concerning the very nature of Muslim identity. 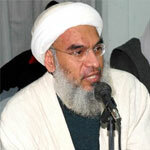 Is it dictated by law or by the life of communities, that are in turn impacted by mystical or Sufi practices. 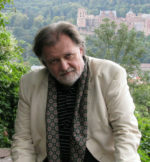 Efim provided multiple illustrations of how Muslims in various places around the world have absorbed and integrated local practices into their Islam, even, in some cases, going so far as to use local sacred sites as substitutes for the pilgrimage to Mecca. Thus spirituality provides a counterpoint to the practices of Muslims in the lived life of Muslim communities across Asia. Muzaffar was adamant that we need to distinguish between the practices of Muslims and Islam. True Islam is the teaching of the tradition, rather than the practices of the people. Muzaffar shared the dilemma of the mystic, whose ultimate goal is annihilation of identity yet who wants to stay in this world and bring a spiritual message to others. One of the texts he brought is in our Sharing Wisdom section below. Meir Sendor (left) from the Jewish tradition and Sallie B. King (right), who teaches Buddhism, both long-standing members of the Elijah Academy, each taught texts that continued the subject raised by Muzaffar – the mystical quest for the annihilation of self. Both spoke about the identity of the individual in relationship to the Divine or a broader reality. Throughout the discussion, participants sought to clarify how the tension between mysticism and identity would play out in relation to conflicting sacred spaces. One particular insight emerged, relating to sacred space and the human person. The discussion noted various instances in which the very sanctity of space is indebted to the sanctifying presence of the human person (alive or dead). This raises fundamental moral issues regarding space and human person and their axiological relationship. A focus on mystical life has the potential to remind us of the primary value of the human person. 1. How is identity constructed? One way is adversarial: Constructing as different from the other; to have one identity is not to have another. But the “other” can also participate in the construction of self, when we consider the possibility of borrowing and modeling on another. This has implications for our understanding of otherness, both in relation to God and in relation to the religious other. 2. Identity itself is not fixed. It is shifting. It can shift in the history of a community. It can also shift in its relation to another community. Shifts can include the breakup and split of one religious community from another, so that someone who was part of the community at one time becomes an outsider. The recognition of changing identities raises the question of how to identify a stable core. It also raises the challenge of where religions should meet or engage – in relation to some essence, transcendent dimension, fixed dimension or in relation to the changing dimension. 3. Identities may change according to different typologies of religions (see above.) Question for discussion – Can we assume that issues of identity will be easier/ more open and tolerant/less violent for one model or the other? It may be that regardless of how identity is constructed, concerns for identity and how it relates to the other will have same role for religions that belong to the different models. 1. Why should we have mystical experience? For some it is a value in and of itself. A second option is to effect change in the world. 2. What is the social power of mysticism? Does it only relativize individual identity, or can it also serve as a means of critiquing various social structures. 3. Mysticism and morality – Can a grand mystical view run the risk of moral blindness to the reality of the other? How is a fine moral sense maintained in relation to the other, while upholding a grand mystical scheme? 4. Can mysticism help advance a new form of understanding that bridges religions and can mysticism serve the interreligious quest? 1. How is identity constituted in different dimensions of religion? 2. Is the quest to construct identity at odds with the openness necessitated by the spiritual process? 3. Does Mysticism provide us with resources for thinking differently about identity? 4. Do we have the capacity to appreciate the mystical experience of the other? Does it require identity of some kind? Does it assume some commonality? 1. One of the outcomes of mystical deconstruction of identity would be opening to the other. Our overall challenge is making room for otherness. 2. One of the challenges is to negotiate negation or transformation of self and moral responsibility. More broadly speaking, it invites to a consideration of the very purpose of mysticism. Is it a goal in and of itself, or is it meant to help transform life, in a return movement to life? 3. The question of identity and morality plays out differently in relation to group identity. Here we notice that identity in a group situation plays out differently with mysticism. Principles that are central to the individual at times operate in the reverse when it comes to group identity and its moral challenges. 1. We recognize multiple factors of sanctification – God (or His attributes’) presence; historical memory of foundational moments; communal consensus; investment and buildup of prayer and other religious activities, offered by the religious community. A foundational question arises – is identity more closely linked to one or another of these dimensions of sanctifying space? If identity concerns can lead to tension and bloodshed, does it matter what one’s starting point is in terms of understanding of sacred space, or would one kind of understanding make it easier to reduce religious violence? 2. What is the dynamic of sacred space and holy person? Where is the source of sanctification? The relationship of space and person has moral implications, especially when these come to contested sacred space and the implications of bloodshed these may generate. 3. As identity shifts, also attitude to holy places shifts. We need to consider changes in centrality and view of holy places in different periods and not consider it a static. 4. Impact of mysticism on “holy place.” Mysticism can have a relativizing effect. Do secondary pilgrimages to sites other than the main pilgrimage site (see case of hajj and secondary pilgrimages in case of Islam) weaken the tensions associated with competing sacred places. Note of interest – some secondary pilgrimage sites can allow for shared sacred spaces, as seen in Bukhara. It is also worth noting that many of the secondary holy places are actually related to the remains or memory of holy people. 5. What is meaning of universal patrimony of sacred places? Can we move them from place of contest between religions over identity to place of spirituality that allows a more universal approach to sacred places and consequent sharing? How does emphasis on identity to spirituality allow different approach to sacred places recognizing broader commonality for humanity? Alternatively, are there understandings of sacred space, such as humanitarian, that have less of a potential for conflict and competition? For discussion: what are the intrinsic qualities of a holy place that would give them appeal in a universal way? Individual cases show that at times even within a tradition there is no agreement. Can we, therefore, suggest universal traits? 6. Holiness cannot be divorced from moral responsibility. This raises the challenge of what holy sites mean in terms of the moral responsibility and their relationship to the other. 1. Can sacred places be sacred to more than one tradition without competition and bloodshed? Is it sanctity or ownership that is at the root of conflict and bloodshed? 2. Where do religions meet each other? 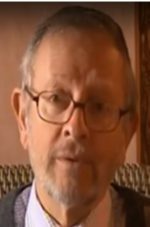 Does mysticism open us to dimension that is more universal and therefore shareable, as opposed to particularity of systems such as law that are more specific to each tradition? 3. When a vision of a religion is complete and makes room for the others within a grand view, specifically a mystical view, how do we go about negotiating multiple claims? It is easier to deal with exclusivism or pluralism than inclusivism.